The photo below is of a pub in Wythenshawe, South Manchester in the early 70's. My Mum who grew up down the road went in the off-licence on the left for bottles of Guinness in the 60's. The "outdoor" as it was popularly known was also where you bought draught beer to take away in jugs. 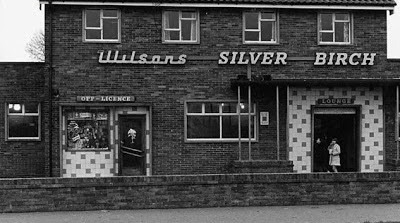 The "outdoor" at the Silver Birch is long gone, along with Wilsons Brewery in North Manchester that owned it, but the pub itself is still there and as this photo shows it's been knocked through and added to the rest of the pub as many a snug and vault were in the 70's. I don't know of any pubs that still have an off-sales counter where you can buy bottled and draught beer to take away. I'm not sure why though – I'd certainly use one if it was available. 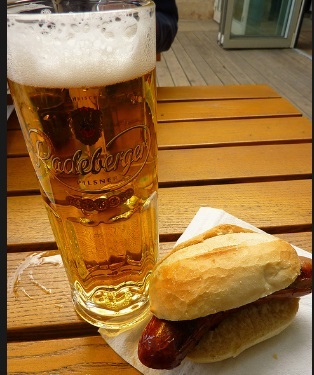 The German news magazine Der Spiegel reports that the environmentally dodgy practice of fracking, extracting gas from the ground by pumping water into it under high pressure, might have a knock-on effect on the country's breweries. German brewers are warning that the chemicals used in fracking could pollute their water sources and undermine the Reinheitsgebot, the former law regulating the purity of beer ingredients that many of them still adhere to. I'm against fracking because of its environmental effects but a thought strikes me: couldn't they just filter the water to get rid of any nasty stuff in it? 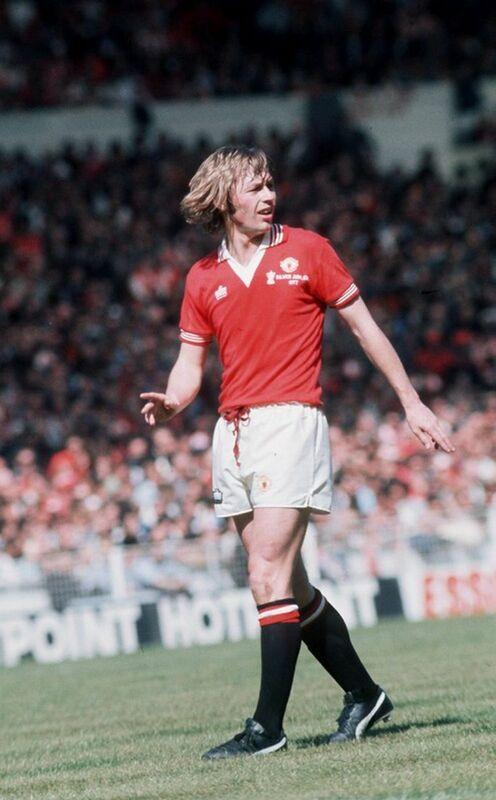 I've just learnt that the footballer Brian Greenhoff has died suddenly at the age of 60. Greenhoff played in the first United team I remember watching in the late 70's along with his brother Jimmy and my boyhood hero, goalkeeper Gary Bailey. Here they are beating Liverpool in the 1979 FA Cup Semi-Final Replay at Goodison Park. If I had Sky TV, I'd probably watch the new series about Greggs, the North East-based bakery famed for its pasties and sausage rolls. 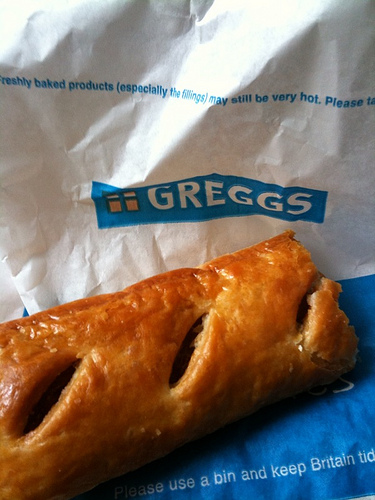 Greggs: More Than Meats the Pie deserves credit for the title alone. I'm not sure what angle it's taking though. In London, Greggs is seen as a shop only poor people go in and the well-heeled sneer at the basic sandwiches as they pay over the odds for a filled ciabatta. In the North on the other hand, Greggs is where office workers queue up for cheap, tasty snacks. Really, what could be more satisfying as a dinnertime treat than a couple of hot, greasy sausage rolls eaten out of a paper bag? I've only just seen this story about an incident at Bayern Munich's last home game in which French Muslim winger Franck Ribery was doused in beer by a team mate celebrating the club's twenty-third League title. The story encapsulates a lot about how the press treats Muslims and doesn't bother to check the facts before printing a story. 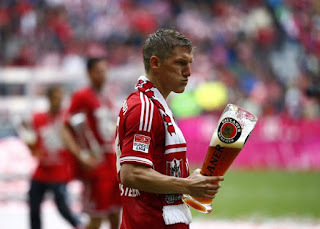 One question strikes me though: why is Paulaner supplying Bayern with alcohol free beer? Returning from West Yorkshire to Manchester last Sunday evening, I changed trains at Huddersfield. Huddersfield railway station stands on St George's Square which while it might not be quite up there with St Mark's or St Peter's Square is still a pretty impressive space. As well as the neoclassical station with its two pubs, it also has a statue of Huddersfield-born Prime Minister Harold Wilson facing the George Hotel, the birthplace of rugby league. It's also where I made my screen debut while working for Granada TV as an extra in the early 90's (briefly, at 49.33). My rugby league odyssey around West Yorkshire continued last Sunday with a trip to Castleford. Castleford's home Wheldon Road is one of the last of the archetypal Northern rugby league grounds. Built in 1926, it hasn't changed much since with standing terraces on all sides and industrial chimneys looming over one end. Before the match, I popped in the pub opposite and as it was keg only had a pint of Guinness. It was the first time I've seen the Guinness surger system where you pour a can into a pint glass and put it on a metal plate that sends sound waves through it to create a thick head. I can't really say it improved the taste but at least it wasn't cold or fizzy. I remember the shock of the coffee-bitterness when I first drank a pint of Draught Guinness in a pub as a teenager in the late 80's. Either my taste buds are going or Guinness is toning down the bitterness. I think I know which it is. I had about forty minutes to wait for a train at Castleford station after the match. Luckily the British Legion across the road was holding an afternoon disco and being a warm day had opened the fire exits so not only could you enjoy the sound of the 60's soul being played but also the sight of middle-aged Yorkshire folk dancing drunkenly while necking cheap keg bitter. I started a weekend watching rugby league in West Yorkshire last Saturday in Wakefield. Wakefield's home ground Belle Vue is the backdrop for the 1963 film This Sporting Life starring Richard Harris as a coal miner who becomes a professional rugby league player. I can't say I really recognised it much as one end is now taken up by a block of executive boxes but the high terrace at the opposite end of the ground where I stood does have a big, low roof that means noise generated by the fans is trapped and amplified, something missing from more modern stadiums with standing areas. After the match, I went to a couple of pubs in the Good Beer Guide. The Black Rock, a darkish Victorian boozer that serves a pretty decent pint of cask Tetley's, was full of older guys watching the World Snooker Championship on TV. At the other end of the pub spectrum, The Hop is a light, modern building with a bare brick interior. Owned by Ossett Brewery, it had most of their cask beers on and was filling up with young people who'd come to see the band that was setting up. Walking back to the hotel, I noticed a brewery I've not heard of before: Clark's, established in 1906 from what the sign on the brewery wall says. According to the GBG, they stopped brewing in the 60's before starting again in the early 80's. The brewery stands in the shadow of HMP Wakefield, a set-up familiar to Mancunians like myself who remember the Boddingtons and Strangeways towers facing each other.